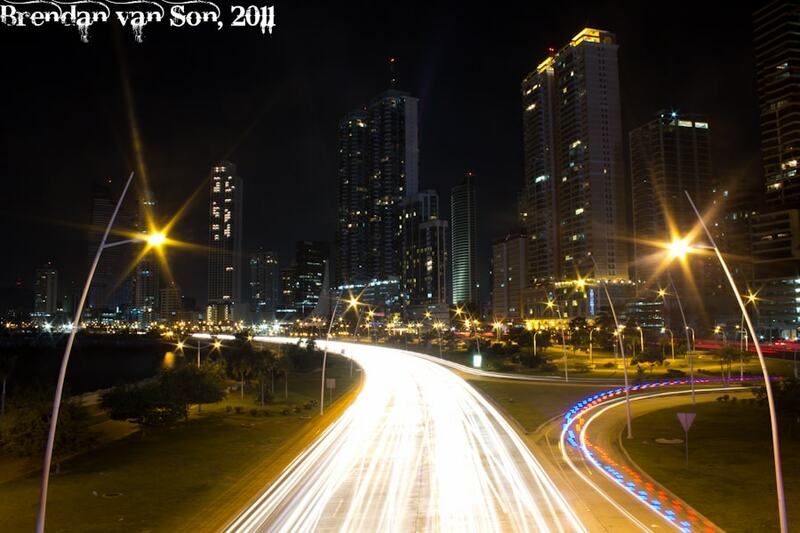 This is the second skyline photo of Panama City I have published now. I have a dozen or so images that are all favourites of mine. Honestly, I had been itching to photograph a skyline for quite sometime. Throughout Latin America there are few skylines that work well for photographs. One exception may be the skyline of Puerto Madero in Buenos Aires. All other major cities just aren’t set up this way. Panama City’s skyline, in my opinion, is the best for skyline photography in Latin America. The main downtown core features a long line of skyscrapers that roll along the coast. To make things easy, the highway out of town curves in a way to give viewers and photographers alike a great vantage point. I shot a couple images from the typical spots, but chose not to pigeon hole my creativity. Thus, I ran across the busy highway with tripod in hand and tried to capture the skyline as well as the busy highway. I then begin to walk home where I came across the second photo by chance. I love the way they turned out. To the naked eye the sky looked black by the time I shot this photo, but the lights of the city along with the tiny bit of light left from the day, were prevalent enough that the camera could see what I couldn’t. I took a quick test shot with an aperture of 5.6 only to see that the street lights looked like blobs of light. That might frustrate many, but I knew that if I narrowed the aperture I would get a skyline featured by stars, not in the sky but along the highway. There are more than a dozen stars in this shot. What I couldn’t plan, however, was how the light trails would look like a trail of fire. That was just chance thanks to the variety of car lights that passed during the length of the exposure. The second photo was set up by sheer chance and good luck. I was crossing the foot bridge over the freeway on my way home at the end of the shoot when I saw a police car turning into the road. I wondered how it would look to have the flashing blue and reds as a light trail. I tossed my tripod up as quick as I could and set the long exposure. It came out really cool. These photos are fantastic, they have such a great sense of movement. I love the starburst from the street lights. Great photos! I love nighttime shots with light trails. Thanks Audrey… I was lucky to have a great subject. The second shot with the trail from the flashing police lights is really sweet. Was trying to time it with the brightness of the giant TV screen so it wouldn’t be completely blown out. Hard to do! @Matt – That TV screen was the bane of my existance. I tried to catch it when it turned red because that was the softest… but it always seemed to flip bright white as soon as I hit the shutter.